NLM is pleased once again to publish a reflection by Dom Mark Kirby, O.S.B., Prior of the Benedictine Monks of Perpetual Adoration of Silverstream Priory in Stamullen, County Meath, Ireland, this time comparing marriage and the monastic vocation from the vantage of the sacrificial commitment to lifelong fidelity, come what may — an urgent matter in an age that finds it difficult to accept either indissoluble marriage or total commitment to religious life. Dom Mark Daniel Kirby, O.S.B. The marriage vow, such as it has been passed down in the Christian liturgical tradition, takes into account the eventuality, I should even say, the inevitability, of sickness. 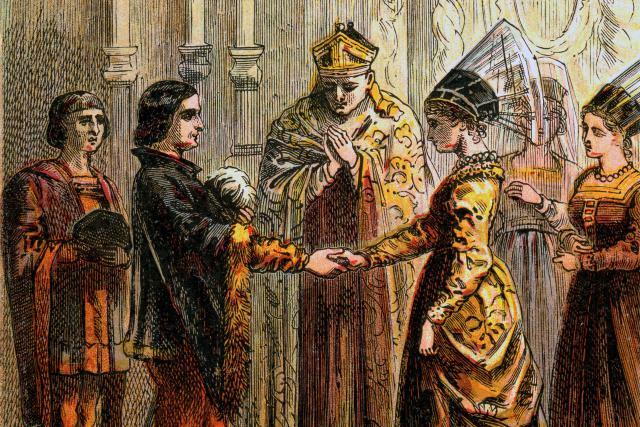 As early as the fourteenth century, bridegrooms were saying to their brides: I take you to be my wife and my spouse and I pledge to you the faith of my body, that I will be faithful to you and loyal with my body and my goods and that I will keep you in sickness and in health and in whatever condition it will please the Lord to place you, and that I shall not exchange you for better or worse until the end. Matrimonial profession is also made in the presence of witnesses, but unlike monastic profession, it is addressed to one’s spouse rather than to God. Whereas a husband gives Himself to God through the mediation of his wife, and a wife through the mediation her husband, the monk gives Himself directly to God. Matrimony is a sacrament because it signifies the union of Christ with the Church; monastic profession is a sacrifice, that is, a consecration, because by it the monk becomes a whole burnt offering to God, a victim laid upon the altar. This is not to argue that the sacrificial dimension is absent from holy matrimony, nor that the sacramental dimension is absent from monastic profession. In marriage the sacrificial offering of self is mediated through one’s spouse, just as the offering of Christ and of the Church are interdependent in the sacred liturgy: Christ offering through the Church, and the Church offering through Christ. In the monastic life, Christ’s self-offering — His victimhood — is made visible in the humble fidelity of the monk who, having once placed himself mystically upon the altar, remains there until the consummation of his sacrifice. While marriage is a sacrament bearing within itself a sacrificial quality; the monastic state is a sacrifice — a consecration — bearing within itself a sacramental quality. In both instances there is the gift of one’s body and goods. In marriage one pledges the faith of one’s body and goods to one’s spouse; this is a sacrament of Christ giving Himself, together will all the merits of His Blessed Passion, to the Church. In monastic profession a man pledges the faith of his body and goods to God; in this way, he unites himself to the sacrifice of Christ, offering Himself to the Father upon the altar of the Cross, for the sake of His Bride, the Church. “For you know the grace of our Lord Jesus Christ, that being rich he became poor, for your sakes; that through his poverty you might be rich” (2 Corinthians 8:9). The word of the Apostle finds a mystic fulfillment in what Saint Benedict writes: “Whatever property he hath let him first bestow upon the poor, or by a solemn deed of gift make over to the monastery, keeping nothing of it all for himself, as knowing that from that day forward he will have no power even over his own body” (Rule of Saint Benedict, Chapter 58). For Saint Benedict, then, the monk is a man offered, an oblation, a victim made over to God in sacrifice. By monastic profession, a man places himself upon the altar together with the oblations of bread and wine. Doing this, he becomes, according to the teaching of Saint Augustine a sacrificium. Just as the husband gives his body to his wife, and the wife, her body to her husband, saying, in effect, Suscipe me (Receive me, take me unto thyself), so too does the monk make the offering of his body to God, saying Suscipe me, according to the word of Saint Paul, “I beseech you therefore, brethren, by the mercy of God, that you present your bodies a living sacrifice, holy, pleasing unto God, your reasonable service” (Romans 12:1). Saint Paul’s injunction is addressed, it is true, to all the baptized. In the case of one married, however, the offering of one’s body to one’s spouse, making of the two one flesh, cannot be dissociated from the offering made to God; the husband does not make his offering to God apart from his wife, nor the wife apart from her husband. In the case of one consecrated in monastic profession, it is by virtue of sacramental union with Christ in the Most Holy Eucharist, that the offering of one’s body is made, symbolically and really, from the altar, directly to God. This is why Saint Benedict enjoins the monk making profession to place the legal instrument of his self-offering upon the altar. The legal instrument, a document written out by the hand of the novice himself, represents his body and all his goods; it is, for all intents and purposes, an extension of himself. We humbly beseech thee, almighty God: command these offerings to be brought by the hands of thy holy Angel to thine altar on high, in sight of thy divine majesty: that all we who at this partaking of the altar shall receive the most sacred Body and Blood of thy Son, may be fulfilled with all heavenly benediction and grace. Through the same Christ our Lord. Amen. A monk brought low by sickness enters into an intimate identification with the suffering Christ. Although he may not feel this, he believes it, repeating as often as necessary the words of the Apostle: “I now rejoice in my sufferings for you, and fill up those things that are wanting of the sufferings of Christ, in my flesh, for his body, which is the church” (Colossians 1:24) and, again, “And I live, now not I; but Christ liveth in me. And that I live now in the flesh: I live in the faith of the Son of God, who loved me, and delivered himself for me” (Galatians 2:20). Before all things and above all things care is to be had of the sick, that they be served in very deed as Christ Himself, for He hath said: “I was sick, and ye visited Me.” And, “What ye have done unto one of these little ones, ye have done unto Me.” And let the sick themselves remember that they are served for the honour of God, and not grieve the brethren who serve them by unnecessary demands. Yet must they be patiently borne with, because from such as these is gained a more abundant reward. Let it be, therefore, the Abbot’s greatest care that they suffer no neglect. And let a cell be set apart by itself for the sick brethren, and one who is God-fearing, diligent and careful, be appointed to serve them (Rule, ch. 36). The community, for their part, will show their sick brethren the most tender compassion in both word and deed. Believing that, save in the Most Holy Sacrament of the Altar, Our Lord is nowhere more present in the monastery than in the person of a monk brought low by infirmity, the monks will treat him with the greatest charity, making allowance for his weaknesses and bearing his burdens. 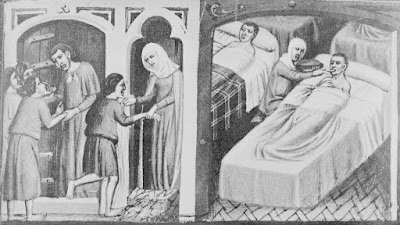 Infirmity and sickness are not impediments to fulfilling the monastic vocation, any more than they would be impediments to a married couple’s growth in holiness. 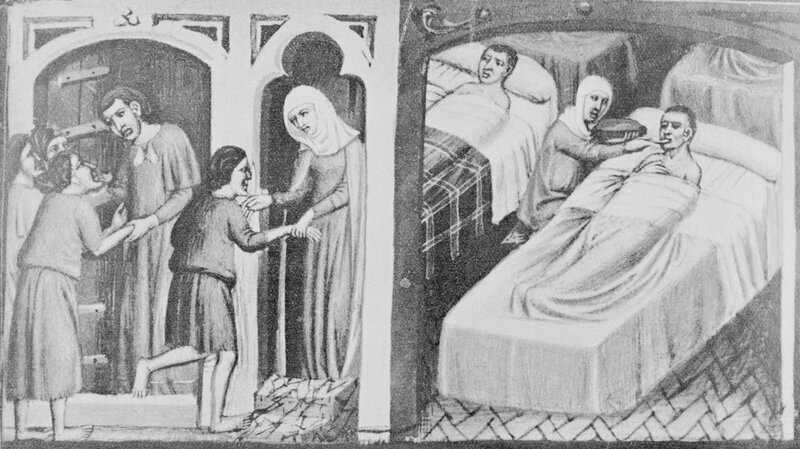 Infirmity and sickness can be, in the monastic life as in marriage, the occasion for an exponential growth in charity, that is, in self-sacrificing love. To fidelity “in sickness and in health”, the marriage vow adds (in the words of an old French formula) “and in whatever condition it will please the Lord to place you, and that I shall not exchange you for better or worse until the end”. The monk, by vowing stability in a particular monastic family, binds himself in the same way to the community that receives him. He vows to remain faithful to his monastic family “in whatever condition it will please the Lord to place it”, promising that he “shall not exchange it for better or worse until the end”. This means, not only, in sickness, infirmity, and poverty, but also in persecution, exile, war, and famine. The annals of monastic history attest repeatedly to acts of heroic fidelity to the vow of stability. The community, for its part, pledges loyalty to each monk “in whatever condition it will please the Lord to place him”, promising not to exchange him for better or worse until the end”. Just are there are romantic notions of marriage in which neither spouse never grows sick, or weak, or old, and never loses his or her attractive looks, hearing, memory, and mobility, so too are there romantic notions of monastic life in which the community is fixed in an immutable physical and moral perfection, untouched by illness, weakness, poverty, and persecution. Such romantic notions fail to withstand the message of the verbum Crucis, the message of the Cross. “The word of the cross, to them indeed that perish, is foolishness; but to them that are saved, that is, to us, it is the power of God” (1 Corinthians 1:18). In the end, as a monk is confronted with the vicissitudes of life, with his own weaknesses, and with those of his brethren in hac lacrimarum valle, he takes comfort in the words of Christ to the Apostle and makes them, in every way, his own: “My grace is sufficient for thee; for power is made perfect in infirmity” (2 Corinthians 12:9). Chastened and humbled by the experience of his own infirmity, he begins to say in truth, “By the grace of God, I am what I am; and his grace in me hath not been void” (1 Corinthians 15:10), and again, “Gladly therefore will I glory in my infirmities, that the power of Christ may dwell in me. For which cause I please myself in my infirmities, in reproaches, in necessities, in persecutions, in distresses, for Christ. For when I am weak, then am I powerful” (2 Corinthians 12:9–10). The monk, by abiding in the stability of the monastic family, like the husband and wife, abiding in the stability of matrimony, transcends himself and opens himself to the gift of a supernatural generativity. The journey into a mystic — that is, a hidden — fatherhood is rendered possible by the monk’s fidelity to the grace of monastic consecration “in sickness and in health and in whatever condition it will please the Lord to place him”, and this until death, and even into eternity.